China has become a true powerhouse behind potential movie grosses, as evidenced by the gangbusters box office Warcraft has been doing there ($221-million, versus $47-million in North America). Faced with a vocal segment of the North American audiences that has pre-judged and boycotted Paul Feig’s Ghostbusters reboot, Sony had hoped China would offset the cost of the picture. China, though, has now denied the movie a release in their country. China is famously strict with the number of outside films it approves for screening within its borders, only allowing 34 non-Chinese movies a year. Another huge hurdle the movie faced was a long history of China banning movies with ghosts. Censorship guidelines prohibit films “that promote cults or superstitions” — which is why the original Ghostbusters (titled Ghost Catcher Dare-to-Die Team upon its 1984 submission for approval) and its sequel were never shown theatrically in the country. It turns out the reboot, to have been titled Super Power Dare-to-Die Team in China, was denied release not for the latter but for the former. “Most of the Chinese audience didn’t see the first and second movies, so they don’t think there’s much market for it it,” the source added. It’s worth noting that another source told THR that the film hasn’t officially been submitted for approval yet (although both hurdles still stand to scuttle the reboot’s chances). 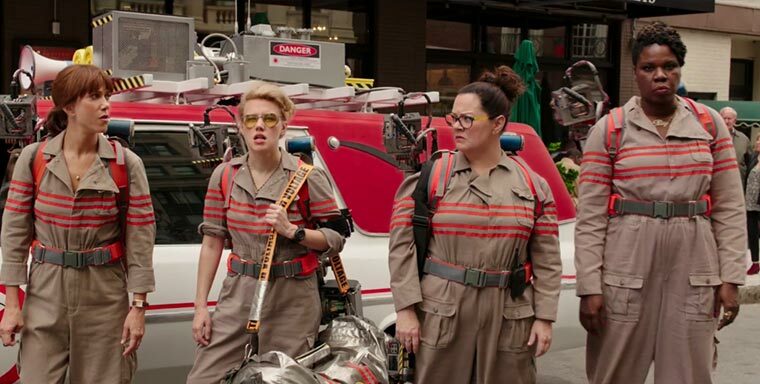 While early reviews for the comedy starring Kristen Wiig, Melissa McCarthy, Kate McKinnon, and Leslie Jones have been positive, box office projections for Ghostbusters‘ opening weekend are only hovering around $40-50 million domestically, largely because of the stigma attached to the project online. China is expected to bypass the United States and Canada as the top film market by 2017. Captain America: Civil War, Warcraft, and Zootopia have each earned upwards of $190-million in China this year.